Despite the financial crisis Wright Connections of Wotton-under-Edge is bucking the trend in shopping centres across the country by moving and expanding into larger premises at the end of this month. 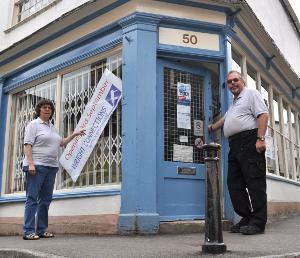 Colin Wright, who with his wife Hazel runs Wright Connections - the only specialist electrical and lighting shop in the area, says they have outgrown their present location in just over two years of trading in the town. They will be closing the doors at their current location in Church Street, Wotton for the last time on the Saturday of the up and coming Bank Holiday weekend (27 August) and moving across town to bigger premises (at what used to be Martingales) at the top end of Long Street; reopening one week later on Saturday 3 September. And to celebrate the move they are to present ‘goody bags’ to the first 50 customers making purchases of over £5 from their new shop.